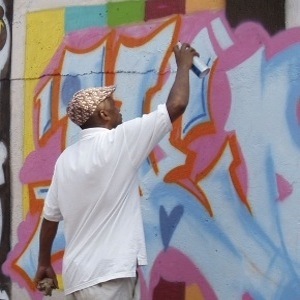 Marc “Beam” Williams, a native of Spanish Harlem was drawn to the arts by way of graffiti in the 1970s and early 9810s. Introduced by his older brother ( no comp2 aka tony rome), young marc came up with the name Beam after much trial and error with other names that simply didn’t stick. Now with his tag in tact ( it was 1979), he and his first writing partner race sought to get up and become style masters like those before them. Race and Beam managed their goal of going all city as taggers by 1981. The next goal was similar, to do the same with pieces, however as with most plans , life always throws you a curveball. Most of the writers of this day will tell you that the buff was one of their greatest enemies. That said, the fearless duo began their journey to do the do to mixed results. At the same time, the world around them was changing. Race and Beam became members of tc5 by way of 2near and doze. So many things opened up during this time. Beam and another collaborator, doc, were invited to the style wars movie set by photographer Henry Chalfont, as well as the now historical OK Harris gallery event that in many ways changed the face of graffiti. Now, all those cats you wanted to meet or beat were out in the open. The community had branched out for better or for worse. Race, doc, and Beam took full advantage of this special time in graffiti history. The fame game was changing and so were the artists; Seen, Doc, Doze, Juice, Beam and others were key members of the transitional Cool 5, each offering their unique talents to an incredible lineage of artists. Beam, known to most as the idea man, began doing original airbrush t-shirts, store awnings and advertising among other things. Still piecing, doing galleries and legit walls, hints of a future as an artist began to inspire Beam and others. Also of note; creating an original pitch for an animated feature film (featuring the 5 as the main characters all to be designed by doze), the concept for a jazz go-go band, a record label, a management company and a clothing line. Each endeavor had varying degrees of success. The sky was the limit and continues to be, but graffiti was the starting point for this inner city artist known as Beam. Today, Beam is a writer, artist and filmmaker who’s works are immersed in the spirit of his youth and days as one of the many hip hop pioneers. Stay tuned, there still much to behold, because everybody admire magic.